Today I’m headed to New York and seeing that it’s my first time to the big city I’m very excited to get on the my way and get there. While I was ready to go my train on the other hand was in no hurry and was delayed from my scheduled departure time of 12:50 by half an hour. This trip also marked my first time on a domestic train and quickly fell short to my experiences with the European rail system. 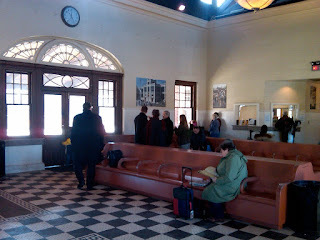 I was shocked at the lack of security at the train station and the vulnerability of the US rail system in light of recent events on US flights. Once on the train I decided to test the capabilities of my Garmin 310XT watch by tracking my route on the train and monitoring the speed. The ride failed to compare to the nearly 200MPH trains in Europe reaching a peak speed of 120MPH at one point throughout my ride. 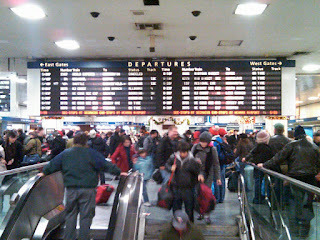 The train arrived in Penn Station around 6PM and I snapped a quick very blurry shot of the departures board before heading off to find Michelle and her sister, Lauren. Out into the Big Apple and ridiculously cold weather that greeted me in New York we very quickly walked a few blocks to a recommended pizza joint. While it wasn’t “New York” pizza, the brick oven pizza was excellent and really hit the spot considering I hadn’t eaten since breakfast. After dinner we headed to Michelle’s sisters place and relaxed for a few minutes exchanging gifts before heading out to the oldest bar in NY, McSorley’s. You have two options for beer at this bar light or dark and the light is really more of an amber color, not the typical “light” you would think of. Another funny thing is that you don’t order the number of drinks you would like, rather you tell them how many people you’d like drinks for and they choose the appropriate amount (usually about 2 per person). 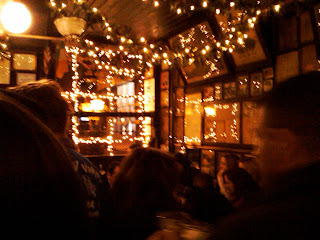 It was pretty apparent the bar was the oldest in NY by the amount of dust hanging off the chandelier. It was absolutely disgusting but I’d expect nothing less from such an old establishment and added to its’ character. 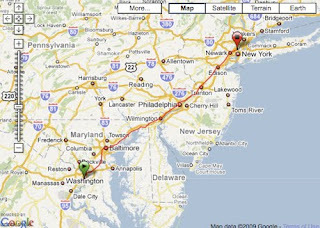 Posted by Unknown at 7:35 PM I'm reading from MyDailyGround: Day 1 - Trip to NY Tweet this!